Tomorrow will be my last chemo for this set of regiment. Reaching this far is really tiring. Next year will be my 6th year fighting my cancer. The story is getting old. I get to the finish line after completing the six-cycle regiment, then we re-stage by perform a scan, and depending on the outcome we do it again–more chemo. Elite runners or athletes would step away from racing or competing to find their drive again. I sometimes do that when each training run is a slug, a chore, or no longer fun. Chemo is definitely not fun. I wish I can step away from it, but I can’t. Every morning on most weekdays I am at the gym by 5am either spinning, running, or lifting weights. Lately, I find it hard to get up and be there with passion. What for? I am beginning to have these doubtful thoughts that I am not going to make it no matter how many hours I put in the gym. What for? There is no rest when fighting cancer. You just have to keep on moving. Also, tomorrow they will do my blood test again. Do I really want to know what my tumor count is? If it show it is trending down, I do more chemo. If it shows going up, I do more chemo. What for? Believe me I know my blessings and I am thankful. I am also not Superman and know my limits. Right now, I am tired but has to keep on moving. What for? P.S. Thank you to my college buddies who included me in their small reunion via Skype. It was good to see them. I am also grateful to see another college buddy, StanleyT from Dallas, who treated me, my wife, my mother, and mother-in-law to a wonderful dinner. I am blessed. ver the weekend was the running of the Chicago marathon. Dennis Kimetto won the race at the same time breaking the course record in 2 hours 3 minutes and 45 seconds. It was an amazing run by Dennis. Congratulations! Normally, I would tell you the back stories about the winner and all the details of his run. I was even there to see him at mile marker 26, just 200 yards to the finish. I was cheering him on to break the world record of 2 hours three minutes and 23 seconds. So close and yet so far out of reach. This time around it is not the winner of the marathon who made news in Chicago, but the story of the last finisher, Maickel Melamed from Venezuela. Maikel finished the race in 16 hours and 46 minutes by walking!. He crossed the finish line around 1 a.m Monday when the race had started at 7:30 a.m Sunday. I can relate to his message. Cancer or a medical condition should not stop you from making the best out of life. This year I did not run, instead I volunteered at the American Cancer Society (ACS) tent helping runners prepare for their race. It gave me the opportunity to see some of my old friends and fellow runners. It feels good to see them again, and they said the same thing of me. Don’t write me off just yet, I told them. Among those who I met up again was Kristin McQueen. I met her as I was doing my rehab in 2009 (she is a licensed physical therapist) and at the ACS charity event. If you have been inspired by my stories and achievements, I pale in comparison to Kristin. For one. 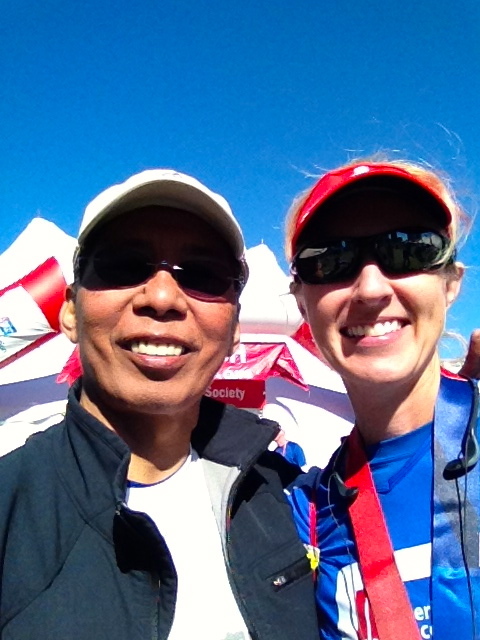 she is a triathlete, have finished nine triathlons, 17 marathons, and have raise more than $100,000 for ACS. And oh by the way, she is a throat cancer survivor and has been fighting it since 2003–way longer than I have been fighting my cancer. She is my idol. A living proof that you don’t stop living your life for cancer. Seeing her renewed my spirits. We need not see each other everyday to commensurate or catch up on life, but when we do see each other, there is clear understanding and appreciation of how we live our fragile life. Sometimes the long absence of news and living with cancer makes you wonder how my fellow survivors are doing. I pause once in a while to remember all of them who have touched me. All have their own way of coping, and all have their own way of living life to the fullest. For me it is just about getting to the starting line …of a race or a brand new day. From there, I will do the rest. P.S. My CEA count or tumor count went down but it is still above the threshold. The signals and the noise: Why so many predictions fail – but some don’t. hat is the title of the book by Nate Silver. The book, and Nate himself, became famous when Nate predicted that Barack Obama would win the 2008 and 2012 US presidential elections. Nate, a statistician by profession, has a passion for numbers. That is where we diverge: I understand the importance of numbers and what they tell, but I don’t necessarily love them. It is a love/hate relationship. Numbers guide me in my decisions, like running pace as measured by minutes per mile, car efficiency represented by miles per gallon, or company valuation reflected by their price-to-earnings ratio. There is one number that I have come to hate lately: CEA levels or tumor counts. Specially, when those numbers refer to my tumor counts and it show it is rising 100% beyond the normal thresholds. I hate it because I cannot ignore it. Then I ask (or others have wondered): How can I run 9 miles on good days, under go chemo, and have metastatic lung cancer? What gives? Which one is the noise and which one is the signal? I struggle with this. I deal with numbers everyday and espouse that decisions should be based on data points to remove biases. It is easy to deal with data when they do not affect you, but these are my data points. My doctor tells me not to worry about about it because clinically I look good, but also adds that he may change my chemo regiment should the trend continues. Really? P.S. My wife and I are thinking of seeking a “second opinion”, which is really the third since we went to Mayo Clinic September 2012. The plan is to go to Memorial Sloan Kettering in NYC where they are using the data analytics of IBM’s Watson project to fight cancer. Use technology to filter the noise.